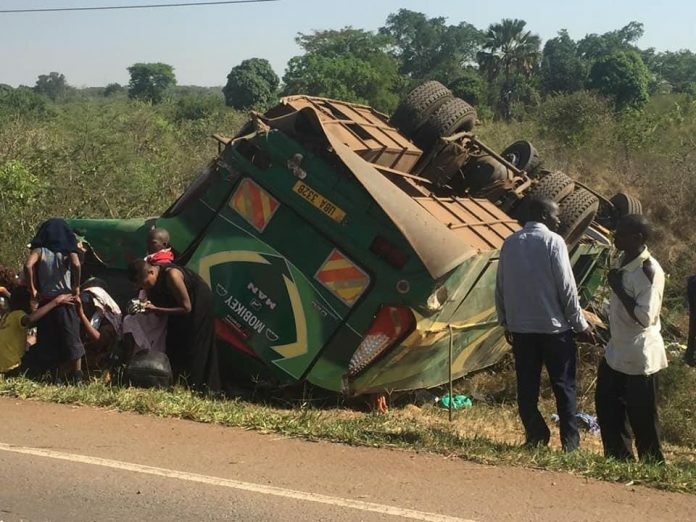 Paul Kangave, the Savannah Region police spokesman, says the accident occurred after the speeding bus, belonging to Link Bus Company, overturned several times at Namayonjo, along the Kampala-Gulu road. Four people have been confirmed dead on spot after a bus Reg. No. UBA 332B belonging to Link company heading to Masindi from Kampala had a tyre burst, losing control and overturned. Over 30 people were injured and rushed to Nakasongola Military Hospital. Only one person has been identified as Matampa Andrew a Police Officer attached to Katwe Police station. 13 people were injured were admitted at Jinja hospital receiving medical attention.